Civil rights leaders and residents of the city of Sanford, Fla., attend a town hall meeting on March 20 to discuss the death of Trayvon Martin, who was unarmed when he was shot by a neighborhood-watch captain on Feb. 26. A group of residents of the city of Sanford rally for justice in support of Trayvon on March 20. Tracy Martin and Sybrina Fulton, parents of Trayvon, pray at the Million Hoodie March on March 21 in New York City's Union Square. 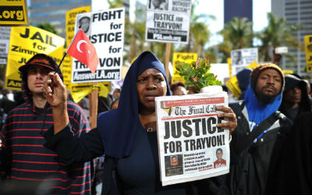 The family members joined hundreds of protesters calling for justice for their son and the arrest of George Zimmerman, who told police that he shot the teen in self-defense. He has not been arrested. Supporters block traffic as they march on West 14th Street in New York City during the Million Hoodie March. Lakeshe Hall demonstrates at a protest rally organized by the Rev. Al Sharpton on March 22 in Sanford, the same day that Sanford Police Chief Bill Lee announced that he would temporarily step down. Supporters worship during a prayer vigil for Trayvon at Allen Chapel AME Church on March 23 in Sanford. Earlier that day, President Barack Obama spoke for the first time about the tragedy, saying, "If I had a son, he would look like Trayvon." Members of the New Black Panther Party rally next to a memorial to Trayvon outside the Retreat at Twin Lakes, the gated community where Martin was killed while walking to the house of his father's girlfriend. The New Black Panther Party said that it was calling for a mobilization of black men to search for and arrest George Zimmerman. The organization has offered a $10,000 bounty for Zimmerman's capture. People hold signs during a demonstration in Washington, D.C., on March 24. Supporters gather around a cross during a candelight vigil outside the Retreat at Twin Lakes on March 25 in Sanford. Participants planted a cross at the site to honor Trayvon. Supporters march through downtown before the start of a March 26 town hall meeting about Trayvon's death in Sanford. The teenager's family spoke at the meeting, along with the Rev. Al Sharpton. Jordan Miller, 10, holds a handmade sign alongside thousands of protesters rallying at the Georgia State Capitol in Atlanta on March 26 in memory of Trayvon. On March 26, people in downtown Los Angeles joined nationwide protests in memory of Trayvon. Protesters were marking the one-month anniversary of his death. College student Jajuan Kelley covers his mouth with a Skittles wrapper as he stands in a crowd of thousands rallying at the Georgia State Capitol. People light candles and write messages during a vigil in Washington, D.C., on March 26. The Rev. Al Sharpton; Sybrina Fulton and Tracy Martin, parents of slain teenager Trayvon Martin; and the Rev. Jesse Jackson Sr. attend a community forum at Macedonia Baptist Church on March 26 in Eatonville, Fla.